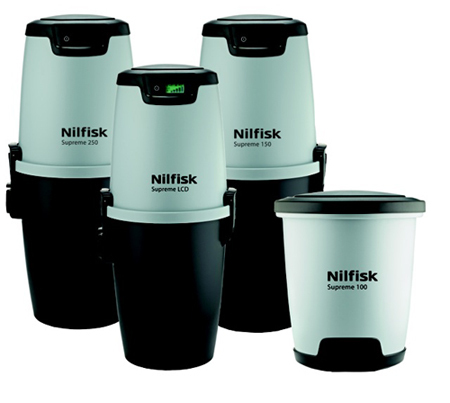 If your vacuum recently "died" or you're unhappy with the performance of your current vacuum and wish to purchase a better one, we would highly recommend you consider purchasing a Nilfisk vacuum. While Nilfisk is now a global powerhouse in the vacuum industry, selling its products in 70 different countries around the world, it was founded all the way back in 1906 in Denmark. Nilfisk entered the Canadian market back in 1965 and has been a trusted supplier of high quality cleaning equipment ever since. For a long period of time after the company was formed, the core of the Nilfisk vacuum empire revolved around commercial and industrial grade cleaning products, but in 1988 they moved into the consumer market and began selling central vacuum systems designed for residential users. Supreme 100 - This model is the most space efficient Nilfisk vacuum available in terms of the central vacuums they offer and is ideal for homeowners that own a smaller property. That doesn't mean to say it offers inferior performance though, since it still features the same motor and control panel that the larger models in the range possess. Supreme 150 - Double the capacity of the Supreme 100, this model's dirt receptacle is full size even though the overall size of the unit remains compact. Its 595 air watt motor provides it with the power to offer the level of suction you expect without creating uncomfortable levels of noise. Supreme 240V - With the same dimensions as the Supreme 150, you could be forgiven for thinking you are seeing double. However this Nilfisk vacuum distinguishes itself with a more powerful 727 air watt Domel motor that comes with a 15 year warranty as opposed to the standard 10 year warranty. Active Noise Reduction System - This is a patented system that's right up there with the very best and operates at a consistent 64.5 db output, protecting your home environment from unwanted noise. Furthermore, this system doesn't use heat retaining foam, ensuring the motor life is extended. Powerful European Motors - The motors featured on the Nilfisk central vacuum range allow up to 300 air watts to be achieved at the hose end, outperforming all competitors by 20 percent. This ensures a Nilfisk vacuum is able to maintain a high level of performance even in a larger home. Self-Cleaning Filter - These vacuums come fitted with a commercial grade, permanent filter that "self-cleans" minimising the stress placed on the motor and further extending its functional lifespan. This feature is the reason why Nilfisk can offer such good warranties on their vacuums. If you are interested in a Nilfisk vacuum and you live in Toronto, Richmond Hill or Thornhill, contact Amati Home Systems Ltd.